Read the rear cover of personal life coach Denny Stockdale's purposeful short paperback and find unanimous support and copious praise for this little book of spirtiual dynamite. Each short appraisal in standard black type ignites the enthusiasm. It excites the reader to take a leap within and discover and affirm their unique and individual potential. The author has successfully guided and motivated people searching for answers to life's challenges for a number of years. He understands the magical power of words and is able to instruct seekers to use them to develop their own talents and deal with their own personal demons. He does this by creating acronyms, that is making a significant phrase from uplifting key words such as 'dreams' . In this book he begins each readable chapter with a thought provoking word. He starts with the word 'FAITH', something most of us could use a lot more of. Then after a few well chosen spiritual quotes in italics to relax the stressed and overly criticised part of our being he begins a gentle story, putting us at out ease by talking about those niggling everday concerns that happen to everyone. He tells us about meeting Tag who is a young man in a torn t- shirt and faded jeans who is distraught because his good friend and mentor has gone missing. The author has a headache which is bothering him but the message here is that there are worse scenarios. He provides an ear and sympathetic words to the person in distress. The story unfolds and each new chapter has a key word for a title. These being, after faith, 'DREAMS', 'AIM', 'HOPE', 'PRAISE', 'LOVE'. I surmise the purpose of this is to stimulate in the reader the idea that problems shared can be lifted and encouragement is a valuable tool for achieving personal happiness. There is a storytelling section of each chapter which follows Tag's friend Randy's disappearance due to being bitten by a snake and his emotional progress on the uncertain road to recovery.Then follows a short undemanding exercise which draws the reader out and instructs us as to how best help ourselves in life's struggle. There is much to recommend in this book. The language is easily formal, uncritical and stimulating. A favourable point in my opinion and a strength which I admire is the author's attitude to not patronise the reader. The introduction is a great opening: motivation being the key. Here the writer uses exclamation points and repeats the word WAKE UP! to persuade the reader to get up and live life and have the courage to make his dreams materialise. I also liked the simplicity and clarity of speech in which this lovely book is written. It encourages the reader to ease himself out of the negativity that may be caused by detractors, despair or even just the blues. I found it relaxing and uncomplicated in its approach. Rather than being a book about drive and ambition and how to conquer the world the emphasis is on defining your own values and being your own person. In the book Tag's friend encourages him with some words of wisdom to, 'have as many dreams as he wants. Life is like ice cream. Start with one and find joy with that. Then another day try another flavour.' 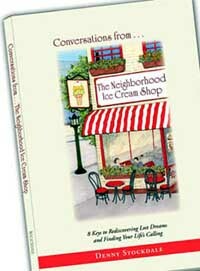 His big dream was to open a shop called the neigbourhood ice cream shop and as the title of this engaging book suggests his dream was realised.